Japan Karuizawa wedding – Let’s appreciate the beauty of autumn and winter! Are you ready for the fall? Recently, I realized that there is a cool breeze outside which hurriedly remind us that autumn and winter actually came……Well, many people like spring and summer because the atmosphere is joyful and full of warmth, and flowers and picturesque views are easily seen. But some of us love autumn and winter more because of its tranquillity, gentleness and mystery. Autumn in Japan is full of orange red maple leaves with dazzling sunshine, as if they always encourage people to love one another every moment. 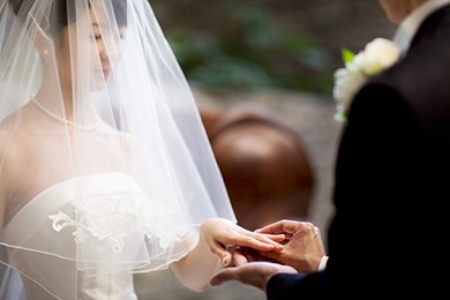 If you are about to marry a partner, you might consider going to Japan Karuizawa to get married. Karuizawa is known as the “Small Switzerland”. There are stone buildings, forests and many other elements. 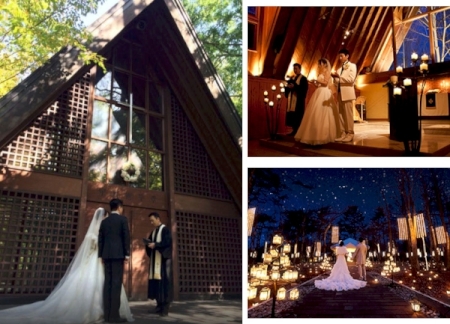 Karuizawa has all the ideal and romantic wedding venues. In autumn and winter, Karuizawa is as beautiful and elegant as a fairyland. 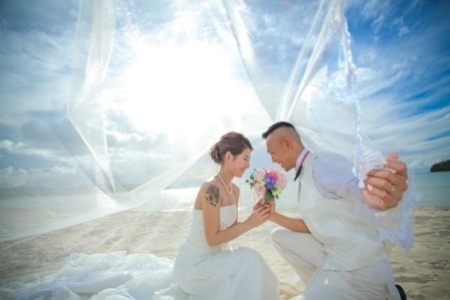 It is tranquil as if the land is being locked into a glamorous glass shadow box and your partner and you will become the happiest price and princess in this world! 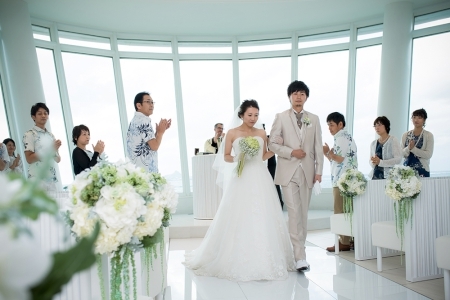 Which places are the most ideal wedding venues in Japan Karuizawa? 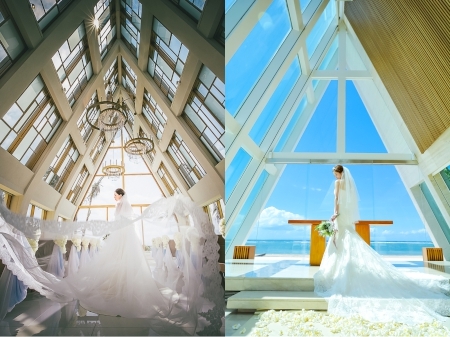 When I take the very first glance of these pictures, I was like, ‘Wow, the fairy tale world really exists, which is quiet, peaceful, dreamy and mysterious.’ The environment there is flattering and relaxing, with the elegant design of this wooden church. We can appreciate the beauty and warmth of the autumn and receive the sincere blessings from nature! In the winter, Karuizawa is different from the past. You will be amazed by the vastness and tranquility of nature. The snow has covered the earth. How can you not fall in love with this place? When I first saw the Church of Stone, I was like, “The structure and design of this church is unique!” The famous American architect KENDRICK KELLOGG injected five natural elements of “stone, light, water, green, and tree” and built the stone in 1988. 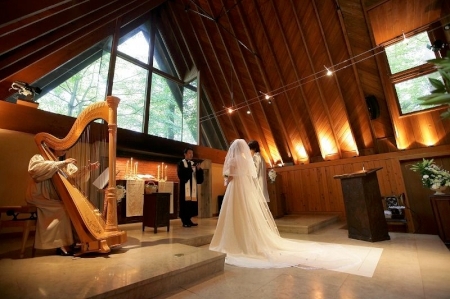 The church is perfectly integrated into the elegant environment of Karuizawa. It is said that the stone represents the male, the glass represents the female, and hope that the newlywed will be always pleased and joyful. Seragaki Chapel – A brand new Japan Chapel opened in September 2018! 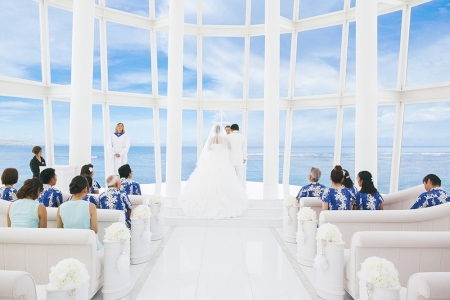 How many times have we seen a wedding venue with a clear blue sky and breathtaking seaview? Well, far too many times. I truly understand what you are murmuring right now: ‘I really want something really special and surprising, unlike the previous ones.’ And recently, my friends recommend me a Japan Chapel called Seragaki Chapel which is a brand new chapel opened in September, 2018. So what does Japan’s latest offering, Seragaki Chapel, bring to the table? Before seeing any pics of this chapel, I had zero expectations, maybe barring one, to be bored to death with its all too common features and characteristics. However, the interior design of Seragaki Chapel really surprised me. The reason why I like a wood ceiling is that it really brings warmth and elegance, and never goes out of style. At present it is not that easy to find wood ceilings in churches. It is no surprise that recent works such as the churches in the Chilean archipelago of Chiloe truly stand out. That is why Seragaki Chapel is so special, especially the creativity shown by the interior design of this chapel. When it comes to wooden buildings, most people may think of words like “tradition”, “nostalgia” and “nature”. On the island of Okinawa, there is a wooden church called ‘Seragaki Chapel’. 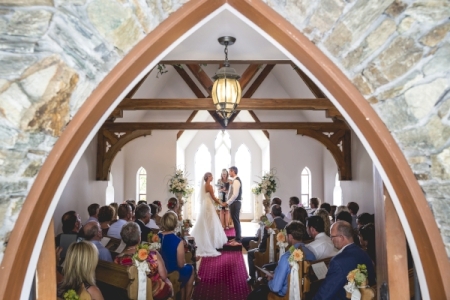 The theme of this church’s design is ‘combination’, which symbolizes the combinations of newlyweds and their family members, becoming a whole new family and starting a new life. 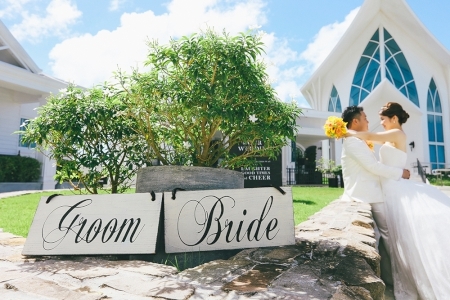 After the wedding ceremony, the newlyweds and relatives can enjoy the island’s unique feast in the banquet room and a cocktail party in the garden. You can also take pictures with friends and relatives on the Seragaki Beach which is just in the front of the church. You can always remember this day and this moment by taking nice pics with your love ones. 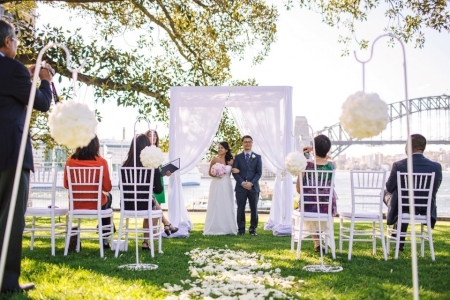 Want a romantic wedding with high privacy? 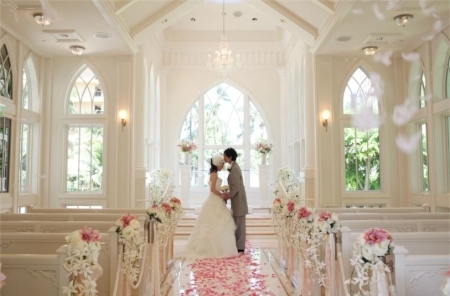 Wedding Village Guam Crystal Chapel is waiting for you! Honestly speaking, most women do like crystals, gems and diamonds, don’t they? It is not because of the value or how expensive they are. Just take the first glance of these sparkling jewels, people are always attracted by these shiny and bright things, which is the nature of human beings. What do they truly symbolise? Maybe because everyone have a glance of these gems, it feels like being cherished, which is the true meaning of crystals and jewels. 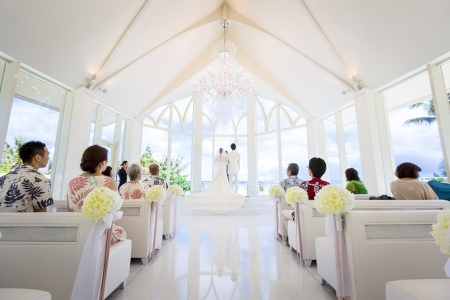 It is no surprise that many newlyweds and couples like travelling to Guam in the United States, because there are one of the most famous church – Crystal Chapel. 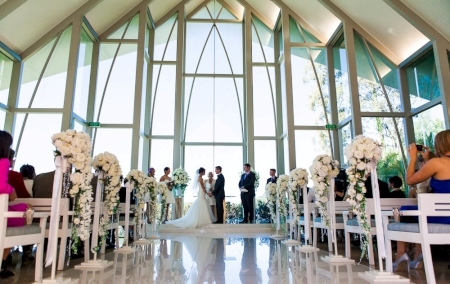 What makes Crystal Chapel so special? 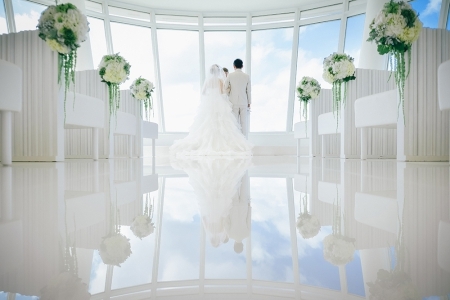 Among thousands of wedding destination, why can Crystal Chapel stand out from the crowd? Crystal Chapel was built in 2006. 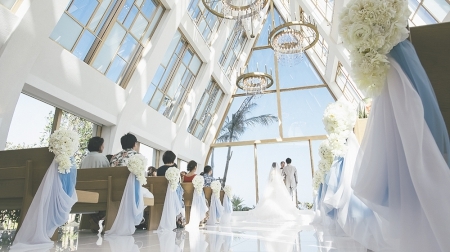 Just give a glance of the architectural design of Crystal Chapel, it looks like a glass lodge in a fairy tale, which is magical, modern yet elegant. From the crystal clock in the wedding ceremony to the crystal cross in the centre of the church, you can see “crystal blessings” everywhere. 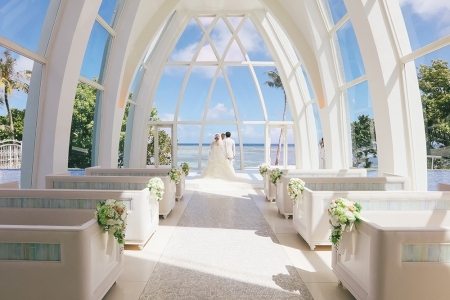 When you are standing outside the church, you can easily look at the breathtaking sea view of Tumon Bay, just like being surrounded by the clear sea water. The most special ceremony must be the “Crystal Oath”. Newlyweds just clasp their hands, put their hands on a huge crystal and let the crystal become the most beautiful amulet of the marriage. 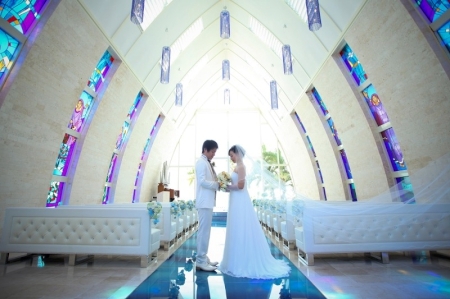 Why should we choose Crystal Chapel as our best wedding destination? 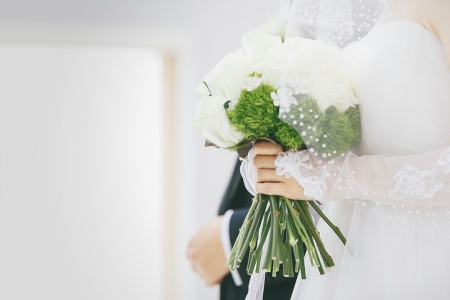 Well, everyone would like to have their own wedding ceremony with high privacy, right? 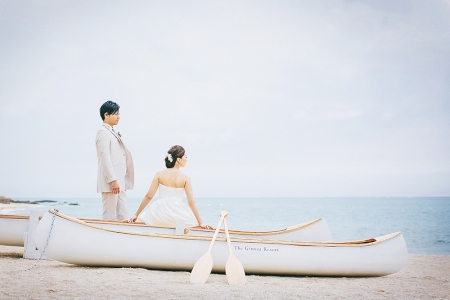 Bump into another newlyweds in the same wedding destination? It will be a nightmare. What you want is to involve just the two of you with a select handful of family and friends, and high privacy is a must. 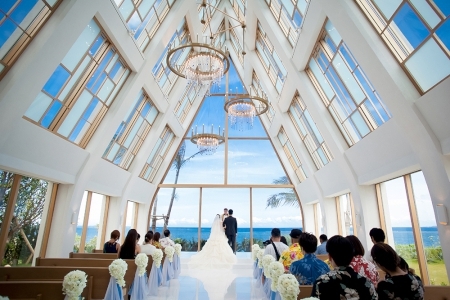 Crystal Chapel is like a wedding village. 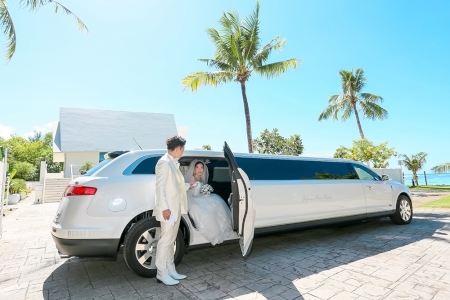 All facilities, including the Bridal Room, the guest banquet hall and photo salon, are all private, creating a special paradise with extremely high privacy. 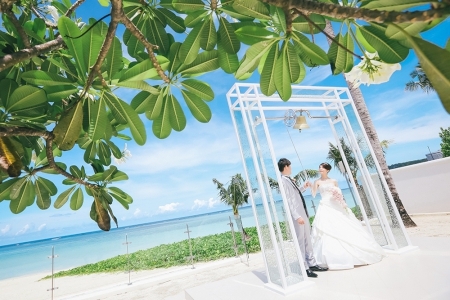 Okinawa Ginoza Chapel – a chapel with nice beach, breathtaking Seaview and gorgeous garden! “Would you prefer to have an expensive and ostentatious wedding with lots of guests or just a simple one?” Well, being a minimalist, I just want everything to be simple and quiet because it makes things and life much better in many ways. If you do have a Mr. Right/Mrs. 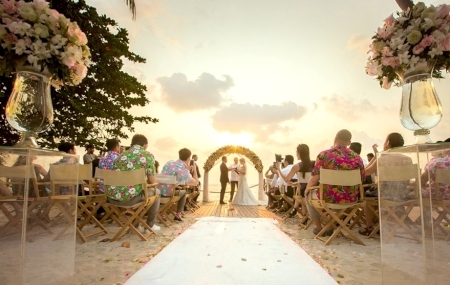 Right by your side, a destination wedding could be one of the best options for you, which can involve just the two of you with a select handful of family and friends and constitute a bona fide week-long family vacation. 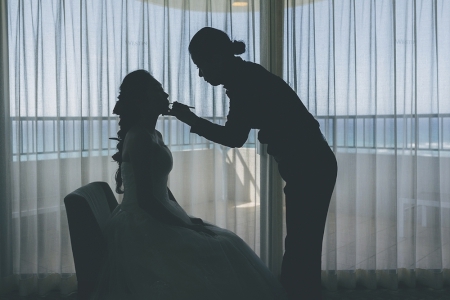 If you are searching for nice wedding destinations, you may find that the scenery around your local banquet hall can be pretty limiting. But open the options to, say, Japan Ginoza Chapel, it will be a totally different option and you will get the makings of some epic shots here. 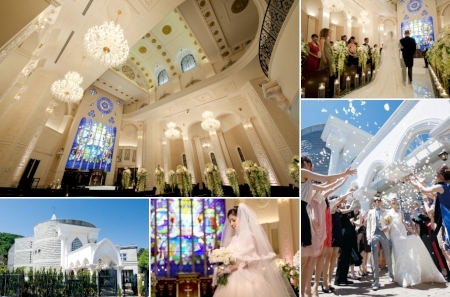 Why choose Japan Ginoza Chapel for a destination wedding? Just standing in front of the Ginoza Chapel, the beach in the front is shaped like a shepherd’s hook of gold, with a jewel-blue sky, breathtaking seaview and gorgeous garden. 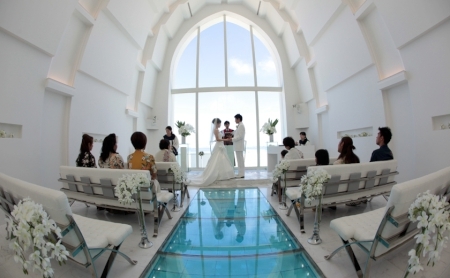 You can see that there is a reason why Ginoza Chapel is always favoured by many newlyweds. You may ask: but what makes Ginoza Chapel so special? The architect, Mr. Otsuka, is the representative of Ginoza Chapel’s overall planning and design. 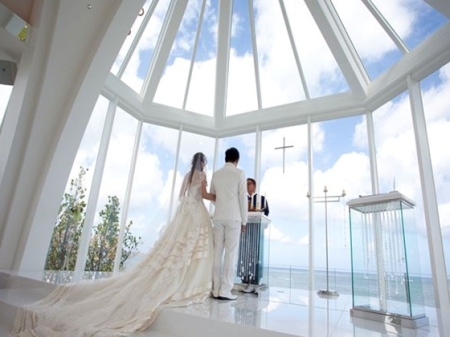 He made good use of the natural beauty of Okinawa, creating a modern, aesthetic and beautiful church in Japan Gino. This chapel is surrounded by forests, garden, sea and beach, which create a postcard-like landscape, with the beauty of tranquillity and nature. 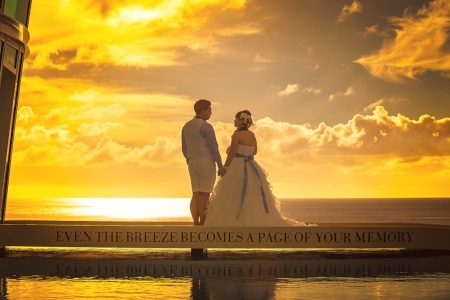 The banquet hall named ‘Beach Terrace’ is just next to the chapel, which is exceptionally convenient. *No banquet is provided in this period.